One of Italy’s greatest treasures, Leonardo da Vinci’s “Codex on the Flight of Birds,” will be exhibited at the Smithsonian’s National Air and Space Museum in Washington, D.C. for 40 days this fall, from Sept. 13 until Oct. 22. The extraordinary document, created ca. 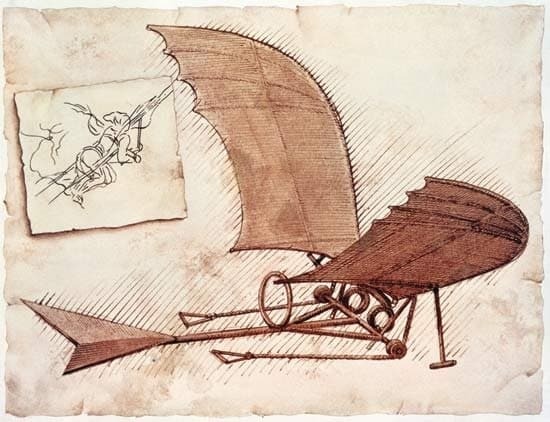 1505, shows da Vinci’s interest in human flight by exploring bird flight and behavior. It includes sketches and descriptions of devices and aerodynamic principles related to mechanical flight that predate the invention of the airplane by 400 years. The Codex, an early form of a personal notebook, will be on view in a specially designed and secured case located in “The Wright Brothers & The Invention of the Aerial Age,” an exhibition whose centerpiece is Orville and Wilbur Wright’s 1903 Flyer, the world’s first successful powered aircraft. Nearby interactive stations will allow visitors to virtually leaf through the 18 folios (two-sided pages) of the Codex. The document will be loaned to the museum by the Biblioteca Reale in Turin, Italy, which owns a number of works by da Vinci. The 16th-century genius is known primarily as an artist and sculptor, but he is also renowned for his skills in architecture, music, mathematics, poetry, engineering,anatomy and botany. A model of an ornithopter, an aircraft that flies by flapping its wings, will be on view at the entrance of the exhibition. The work is based on a drawing by da Vinci in his Manuscript B, folio 74, owned by the Institut de France in Paris. The model was donated to the National Air and Space Museum by Finmeccanica. “For Leonardo, art was the foundation of engineering, and engineering was an expression of art,” said Peter Jakab, chief curator of the museum. “The artist who painted the ‘Mona Lisa’ and ‘The Last Supper’ was a Renaissance visionary who saw the modern world before it was realized.” Jakab, an expert in early flight, is also serving as the curator of the special exhibition. This exhibit is organized by the museum and the Italian Ministry of Foreign Affairs, the Ministry of Italian Cultural Heritage and Activities, the Embassy of Italy in Washington DC, the Biblioteca Reale in Turin, thanks to the support of the Bracco Foundation, and corporations Finmeccanica, and Tenaris. It is part of “2013 – Year of Italian Culture in the U.S.”, an initiative held under the auspices of thePresident of the Italian Republic, organized by the Italian Ministry of Foreign Affairs and the Embassy of Italy in Washington D.C. with the support of Corporate Ambassadors, Eni and Intesa Sanpaolo. research, collections, exhibitions and programs focus on aeronautical history, space history and planetary studies. Both buildings are open from 10 a.m. until 5:30 p.m. every day (closed Dec. 25).